Historically US bull markets are over three times longer and stronger than bear markets. LONDON - May 9, 2017 - PRLog -- As part of its longstanding educational outreach to investors, Fisher Investments UK published a new infographic illustrating the historical nature of US bull and bear markets, including data on their lifecycles, magnitude and duration. Fisher Investments UK has found widespread investor confusion about the nature of market cycles. Most investors have heard the terms bull and bear market, but many struggle to define them and can't identify important traits. For example, throughout this eight-year-long US bull market that began March 9, 2009, many investors fear stocks have gone "too far, too fast." The infographic helps put the current market environment in historical context, shedding light on the evolution of bull markets and their tendency to overcome common fears. By differentiating bull and bear market lifecycles and identifying key points along with way, the infographic offers investors some important signs to watch along the way. 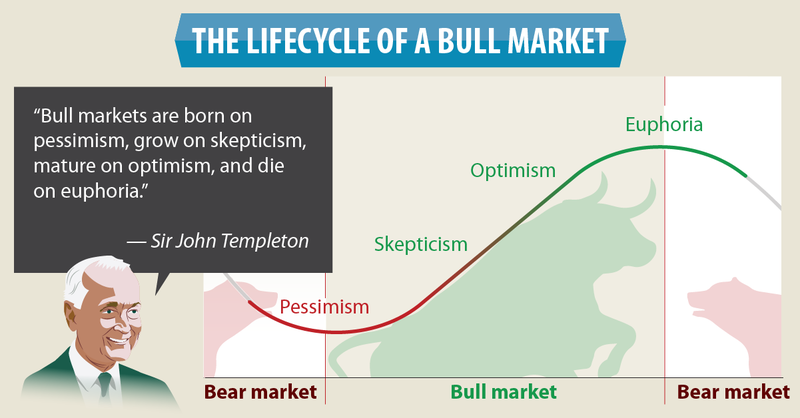 A core concept in the graphic is sentiment's evolution during a bull market. Many investors miss the fact that stocks move on the gap between sentiment-based expectations and reality. For example, if the public is deeply pessimistic—as it was in early 2009—then anything less than catastrophically awful data can be the impetus for a nascent bull market. Conversely, if investors' expectations are euphorically lofty, robust data that misses the mark may be the recipe for stocks to fall. Looking at data or sentiment alone is a common investor error. Fisher Investments UK hopes that by sharing educational materials, like this latest infographic, investors can put the present into better context and avoid potential investing errors. To view the infographic, please visit: https://www.fisherinvestments.com/en-gb/insights/running-with-the-bulls---infographic. Fisher Investments Europe Limited, trading as Fisher Investments UK, is a wholly-owned subsidiary of Fisher Investments. As of 31/12/2016, Fisher Investments, its subsidiaries and affiliates manage over £58 billion in assets for over 175 large institutions and over 35,000 high net worth individuals. For more information, visit https://www.fisherinvestments.com/en-gb.